Here is a long, substantive, and interesting article from the BBC — “We still have not found the missing link between us and apes.” It is interesting for two reasons. It admits that it’s hard to even agree on what the LCA might have looked like. What it doesn’t do is admit the even bigger problem: that we don’t even have transitional forms between Australopithecus and Homo. This is a major omission. That having been said, Barras raises a lot of interesting issues relevant to problem (2) above. Scientists can’t agree on what the LCA looked like because humans share different similarities with different primates. It’s hard to decide which primate we’re most closely related to. This shows that the phylogenetic tree of primates isn’t as clear-cut as we’re often told — humans share similarities and differences with many primates in a pattern that doesn’t makes a nice, clear-cut tree. Primates in general (particularly monkeys) are often relatively small-bodied, and they scamper around in forest canopies by running along branches. But apes are unusual primates. Most have big bodies with extraordinarily long arms. They often get around by swinging below branches rather than running along the top of them – a form of locomotion called “brachiation”. According to many of these early researchers, the LCA was a large-bodied, long-armed, brachiating ape. By the late 1960s, researchers were fleshing out the LCA even further. An anthropologist called Sherwood Washburn pointed out that chimpanzees, and particularly gorillas, actually spend significant amounts of time moving around on all fours on the forest floor. Both apes use their arms in an idiosyncratic way when they walk: they flex their fingers so that their weight bears down on the knuckles. To Washburn it made sense that the LCA “knuckle-walked” too. The behaviour could even be seen as a stepping-stone on the way to walking upright on two legs, he wrote. But it would be wrong to think that everyone was on board with these ideas of a brachiating, knuckle-walking, chimp-like LCA. In fact, almost from the moment that Huxley first put pen to paper, a minority of scientists were arguing that the earliest human ancestors — and the LCA — was decidedly not chimp-like. For instance, just a decade after Huxley’s book, biologist St George Mivart argued that humans shared many features in common with monkeys or even lemurs. Meanwhile, from 1918 onwards an anatomist called Frederic Wood Jones argued that humans had a lot more in common with tarsiers than with chimpanzees or gorillas. … [H]uman arms, hands, legs and feet are not as highly specialised as we might assume. “In these characters man finds his counterparts not in anthropoid apes [gorillas, chimpanzees, and orangutans] but in animals that are clearly regarded… as more primitive,” wrote [anatomist William] Straus. What Straus and a few others were really getting at is that humans show none of the specialised features that allow other apes to swing through the trees. It made sense to at least consider the possibility that humans split apart from other primates before the apes evolved brachiation, or knuckle-walking for that matter. Straus could not say exactly which species should be recognised as our sister. But the LCA could well have been a relatively small-bodied primate that ran along branches rather than swinging beneath them. This disagreement continued for several more decades, says Nathan Young at the University of California in San Francisco. In fact, even into the 1980s it was not clear from anatomical features alone exactly where humans slotted into the primate evolutionary tree. So what made them finally ditch the idea that humans are most closely related to “lower” primates in favor of believing that humanity’s closest relative is the chimp? 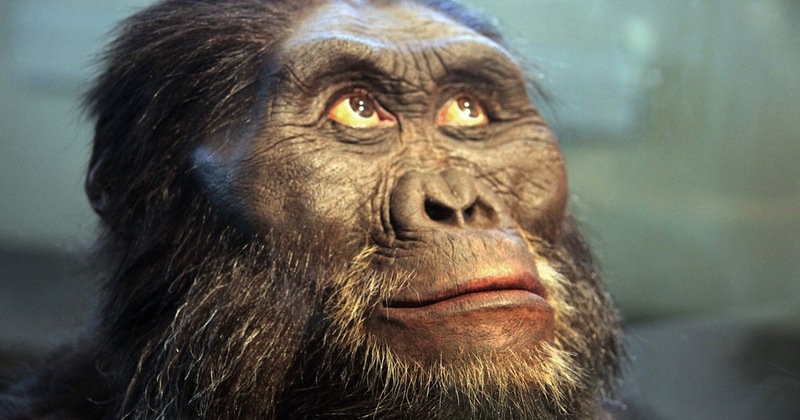 As the article explains, human DNA turned out to be most similar to chimp DNA. So the drift of opinion turned to chimps as our closest cousin. The kicker, however, is this: We’re constantly told that both our genes and our morphology are very similar to chimps. But as this article concedes, some major aspects of our morphology are more like other primates than they are like chimps. So our morphology isn’t necessarily entirely chimp-like. The story should end there, but it does not. Surprisingly, the last 15 years have actually seen popular opinion begin to swing away from the idea of a chimp-like LCA, and towards a model closer to that argued by people like Straus in the 1940s. There are several factors that explain the recent rethink. A more thorough understanding of chimp and gorilla anatomy helped. There had been murmurings for some time that gorillas and chimpanzees (and bonobos) might not knuckle-walk in quite the same way. In 1999, Mike Dainton and Gabriele Macho at the University of Liverpool, UK, looked at the idea more formally. From subtle differences in the way gorilla and chimpanzee wrist bones change as the apes grow from juveniles to adults, Dainton and Macho concluded that the two may have evolved knuckle-walking independently. Over the following decade, other researchers reported similar findings. By 2009, Tracy Kivell — now at the University of Kent, UK — and Daniel Schmitt at Duke University in Durham, North Carolina, were arguing that humans did not evolve from a knuckle-walking LCA. Of course, only if and when fossils of the LCA itself come to light will the debate finally draw to a close. But the search for those crucial fossils is no longer quite as straightforward as it once seemed. In the last five years, some geneticists have begun to question whether the molecular clocks they use to estimate when the LCA lived are being read correctly. It is possible, they say, that the LCA might actually have lived 13 — not seven — million years ago. There are also a few researchers who take a completely different view. For instance, [University of Pittsburgh’s Jeffrey] Schwartz is adamant that it is orangutans, not chimpanzees, that are our sister species. It is an idea he first developed in the 1980s — before, he says, anthropologists “caved in” and conceded that molecules and not anatomy were the ultimate arbiters of the shape of the ape family tree. Schwartz thinks DNA is not the infallible witness on evolution many assume it to be, and that there are many anatomical and behavioural similarities between humans and orangutans that should not simply be ignored. For instance, both have thick layers of enamel on their teeth, and female orangutans (like women) do not “advertise” to males when they are most fertile — something biologists call oestrus. “Orangs are the only other mammal I know of that don’t have oestrus,” says Schwartz. To be clear, few researchers agree with Schwartz. But even putting his ideas to one side, it is clear that there is not yet universal agreement on the LCA. [T]he Ardi analysis was not uncontroversial. One of the implications of their interpretations was that all sorts of anatomical features shared by gibbons, orangutans, chimps and gorillas must have evolved independently in each of these apes. It is true that, today, some researchers have a well-thought-through idea of what the LCA looked like and how it behaved. The trouble is that other researchers have equally well-reasoned models that suggest an LCA that looked and behaved in a completely different way. And that puts the research community in a bit of a quandary. In short, there are so many morphological similarities and differences between humans and other primates that it’s very difficult to draw a phylogenetic tree showing how these species are related. This makes it very difficult to infer what the common ancestor of humans and apes might have looked like. Part of the difficulty, as well, is that we’re not as chimplike as we’re often told. The article doesn’t put it in exactly those terms, but that’s what’s going on. And now you understand. Photo: Australopithecus afarensis, model, Smithsonian Museum of Natural History, by Tim Evanson via Flickr.